Winter gull season is supposed to wind down by mid-March here in Northern Illinois, but we've been fortunate enough to experience a late wave of new birds in Lake County. I spent three consecutive days working the area around the Countryside Landfill last week (25-27 March 2015). Below is a summary of my totals (all adults unless otherwise stated), followed by photo highlights. Kumlien's Gull (adult - photo 1 of 2). Putative Cook-Inlet Gull (adult - photo 1 of 3). Putative Cook-Inlet Gull (adult - photo 2 of 3). Putative Cook-Inlet Gull (adult - photo 3 of 3). Kumlien's Gull (adult - photo 2 of 2). Thayer's Gull (3rd cycle type - photo 1 of 2). Thayer's Gull (3rd cycle type - photo 2 of 2). 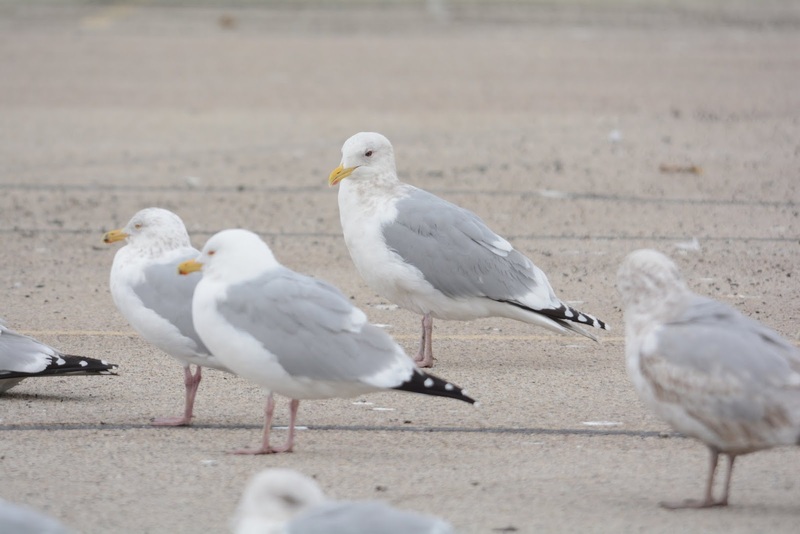 Kumlien's and Herring Gulls (adult, 3rd cycle type). 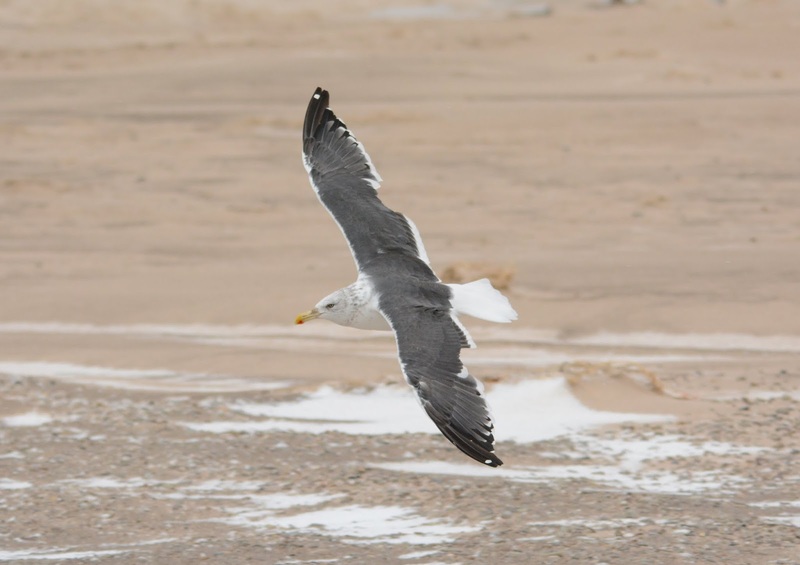 LBBG and Herring Gulls (adult). Ring-billed Gull (adult). Cook County, IL. 21 March 2015. Pink adult Ring-billeds have returned to northern Illinois. The two working-theories are, 1) This pink hue is diet-related and that these birds may have spent their winters south of us (Gulf Coast region?) stocking up on astaxanthin, or 2) This pink hue is an external colorant caused by exposure to the large ore piles where these birds nest. Interestingly, in my 6 years of careful observation of these individuals, it seems much more likely that pink birds pair up with pink birds - at least this is what is apparent while some 400 adults courting and establish bonds near my home in northern Illinois. Of these 400 adults, approximately 5% show some amount of pink in their plumage. Could it be that pink birds attract pink birds, or could it be that they're now staking out nesting sites on the ore piles in East Chicago? Hence, birds that are paired up may be exposed to the slag simultaneously, while birds not nesting on the ore piles remain white and tidy. The latter theory may be supported by the fact that these "pink" individuals become more pink in April and May, suggesting their roosting/nesting sites continue to leave them with ongoing exposure to the ore piles/dust. Although one has to wonder why their legs and bills aren't tinged with pink if this coloration is due to ore piles! Do they do that well of a job of bathing their bare parts? I was told by birders in California, Montana, and Pennsylvania that they're now seeing pink RBGUs too. Strangely, Cleveland lakefront birders don't see Ring-billeds that look like this. Lots of questions and I've never been more unsure about this phenomenon as I am this year. Please send me any photos or comments on these pink Ring-billeds should you have any! Thanks.